A PET scan uses radiation, or nuclear medicine imaging, to produce 3-dimensional, color images of the functional processes within the human body. PET scans can be used to diagnose a health condition, as well as for finding out how an existing condition is developing. 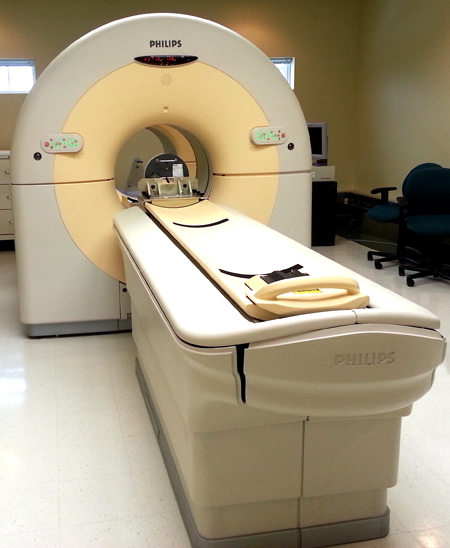 PET scans are often used to see how effective an ongoing treatment is. At Nationwide we put a major emphasis on the quality of the reconditioned medical imaging equipment we purchase. Since we perform our own warranties and service, we must select only the finest in pre-owned devices so that we can minimize our exposure to after installation service issues. On the day we acquire the pre-owned PET scanner, Nationwide crews come out to perform final testing on the system before we remove power from the unit. These tests are to ascertain the condition of the system before it is detached and transported. Once these test are completed, the unit is powered down. Power is removed and the cables are disconnected and organized neatly for packing. All major components are unbolted from the floor and wrapped in padding to protect the finish of the components. OEM dollies are attached to the base of the major pieces and removed to be own transported by a modern air ride semi trailer. The PET scanners are strapped down within the trailer to ensure safety during transit. Once the PET scanner arrives at the Nationwide facility it is again inventoried. The covers of the pieces are removed from the system and tagged as to their location and system number. The covers are taken to the cosmetic repair center. There they will be prepped, masked and painted to the OEM colors or one of those specified by the customer. The major components are cleaned with a variety of processes that sterilize, cleanse, and prepare these devices for cosmetic’s and operations. There are then moved into a testing bay where they are cabled up and powered on. The system is once again tested to determine if all manufactures mandatory upgrades have been performed. Any items that do not exceed the manufacturers requirements or are close to failing are replaced. Once the PET scanner has been thoroughly and completely tested and checked, the covers are reattached and the system is energized for 24 hours to monitor for system errors under test and heated operations. Once this is competed the system is then certified reconditioned. The scanner is de-cabled and wrapped for its next owner. There the PET scanner will be professionally installed by one of Nationwide’s crews.